Many Delmarva breweries enlist the help of local artists to make their craft beer labels pop on the shelf with creative designs, such as peanut butter kisses, mad scientists and the Indian River Inlet Bridge. WEST OCEAN CITY, Md. (AP) — Peanut Butter kisses, mad scientists, the Indian River Inlet Bridge — it’s no surprise brewers are paying just as much attention to the creativity on the outside as the beer inside. There’s also plenty of humor, like what freelancer Yolanda Morris did with the Forced Family Fun lager. The fall beer label depicted a family sitting around the Thanksgiving dinner table, baby crying and covered in food, a young boy on his phone and two family members yelling while the father cuts the turkey. But it’s not just young, smaller craft breweries that put an emphasis on cool cans. 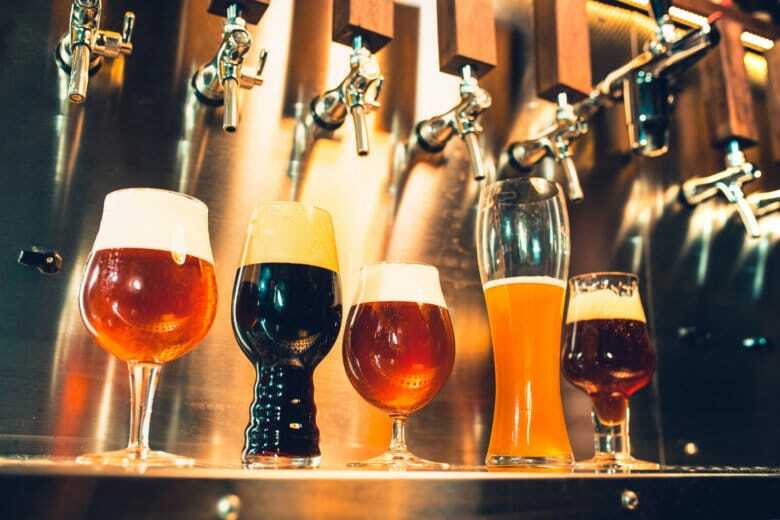 Big-time beer makers like Dogfish Head and Evolution have even more competition to stand out from on store shelves around the East Coast and beyond. Miller changed back to its traditional color a few years ago (the white can), Bud will slap your favorite sports team on a bottle and Coors’ mountains will turn blue, but local craft brewers like Third Wave, Evolution and Crooked Hammock have a smaller audience and can target local themes and brands that allow their consumers to connect. Even Yuengling, the largest independently-owned craft brewery in America based on beer sales volume, keeps an old-fashioned style that hasn’t changed too much through the years. “When consumers can pick from some many beers, you have to have quality packaging,” he said. The first was the Hammerhead IPA, which was named after the owner, Jeff Hamer. Hop vines intertwine with a hammerhead shark as it swims up toward the sun’s cascading rays in the water. But Erickson’s favorite is the Noir et Bleu, one of the top-selling brands. The 9 percent Belgian tripel features the Indian River Inlet bridge at night, matching the translated name, black and blue. Andrew Dickinson owns 302 Design Group and has done work for SoDel Concepts and Rosenfeld’s Jewish Deli, among many other local businesses. The Salisbury University graduate will take the artwork and apply the fonts, layouts, logo and all the required legal information. Since he’s known the guys behind the brewery for a long time, he knows the brand, respects the artwork and delivers. “Marketing is short term, branding is forever,” Dickinson said. Paul Thens loves his job at Dogfish Head as the lead designer. But still, when it comes time to create this year’s version of the Punkin Ale label, there is some pressure. Four labels are designed by Michael Hacker in this year’s iteration — 75 Minute IPA, The Perfect Disguise (a double IPA), Dragons and YumYums (last year’s fruity hit) and the grand finale of this year’s Punkin, the cult classic of pumpkin ales for beer lovers since 1995. “There’s definitely a bit of pressure when it comes to Punkin. . . . It’s a very renowned beer when it’s being associated with Dogfish Head,” he said. With Punkin, it usually focuses on the season, fall harvest or Halloween. This year’s 75 Minute depicted a “mad” scientist, experimenting with a 60 Minute bottle and adding extra hops. A maple syrup bottle looks on inquisitively. Thens’ favorite this year was actually the 75 Minute bottle, depicting owner Sam Calagione as the creative scientist. He said Hacker has a way of bringing a story to life with lots of layers of artwork. “I loved the collaborates spirit of craft brewing as a whole,” Thens said. As for a label to come out later in 2019, Neal Steward, vice president of marketing, said he was looking forward to this year’s release of Dragons & YumYums. Assistant head brewer Mo Colucci, who everyone says has the worst job of the canning line, grabs the now-filled beer cans from the machine, dries them off so the label sticks and puts them in a case. At 17 cans per minute, it’s tough to keep up, especially hunched over on a chair for more than an hour. Then it’s up to co-owner Brandon Smith to make Lt Grey Creative’s hard work come to fruition. He inserts the label sticker, which is on a long roll holding hundreds, and works the foot pedal to wrap the can. “And that’s how we do it,” Colucci said at the end of one canning session. It’s not the most glamorous part of being a brewer, but the hard work pays off. At the most recent special release, people drove from as far as Baltimore and Pennsylvania to buy either two four packs or three cases. This special release featured a Tiramisu imperial sour, a spicy chicken and waffles stout and “Party Cat” — an IPA with a label that really stood out — pastel colors, old-school sunglasses and even a cat emoji with sunglasses.